In retrospect, Dillon Gee called it a lapse in judgment. After all, there was no reason to get cute with Giancarlo Stanton after falling behind in the count, 3-and-0. The smart move was to acquiesce. But after two turns through the rotation, the Mets' starters have made it clear that they aren't backing down from anyone. That includes Stanton, who punished Gee for his hubris by crushing his 3-and-2 fastball into the Mets' bullpen. 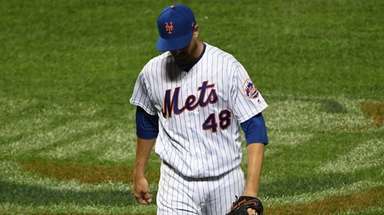 "That's my stubbornness," Gee said Thursday night, following the Mets' 7-5 win over the Marlins. "It was stupid... I just made a dumb pitch." Stanton's home run proved that aggressiveness, on occasion, can backfire. But mostly, it is a virtue, one that had been a point of emphasis since spring training. 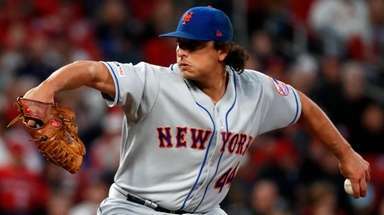 As a starting five, the Mets' rotation has walked just 11 batters through their first 10 games, tied with the Brewers for the third fewest in the National League. Only the Dodgers (10) and the Cardinals (9) have been stingier, though both have played at least one fewer game than the Mets. "They go out there and compete to outdo each other," catcher Travis d'Arnaud said of the rotation. "None of them are really scared of anybody. They just go out there and attack hitters and attack the strike zone." On Thursday, the Mets experienced both the benefits and potential drawbacks of peppering the strike zone. Stanton's first-inning homer traveled 390 feet -- even though he drove it the other way. 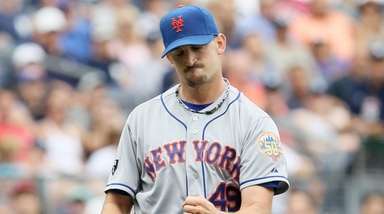 "I attack too much sometimes," said Gee, who didn't factor in the decision after allowing four runs in 5 2/3 innings. "And it definitely got me there." But walks nearly doomed the Mets in the sixth. Gee issued a pair of them in the sixth inning, including one to Stanton with two outs and nobody on. It started a rally. Gee wound up leaving a bases-loaded mess for reliever Rafael Montero, who let the Marlins snap a 3-3 tie by issuing a free pass. For the Mets, it was a rare break from form. While plenty of season remains, manager Terry Collins called the Mets' propensity for attacking the zone "very encouraging." It certainly hasn't hurt. 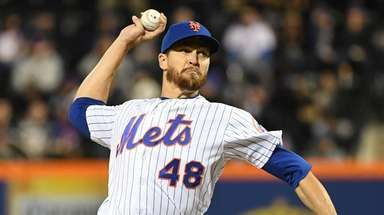 Mets starters rank fourth in the NL in ERA (3.03), fourth in WHIP (1.20), and second in strikeouts (54). Despite early season pitch limitations, the Mets have averaged nearly six innings per start, a direct product of limiting walks. 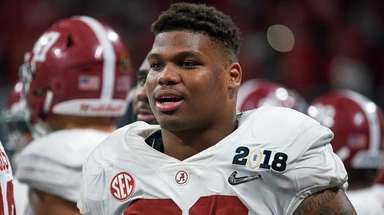 "Hitting is a difficult part of the game so, if you can make teams swing the bat to beat you, you've got a chance to get them out," Collins said. "If you're putting them on, it defeats the whole thing. With our staff we've done a very good job of pitching."